Phantasm has been with us for close to 40 years and ever since the Tall Man unleashed his diminutive minions on an unsuspecting horror-loving community we, its faithful followers, have not gotten enough of its quirky, iconic characters. Now all 5 of the terrifying, if perplexing, films are collected in one place and are set to drop on 9/19/17, and I, for one, am excited about it. Phantasm, as a series, always stood apart from the other films of its time, it possessed a dreamlike story and left its viewers, as well as its own characters with an anxious uncertainty; you never quite knew what was real and what was a nightmare. In a nutshell, Phantasm asked you to not only suspend disbelief but to actually think. They also populated its stories with the unlikeliest of heroes. These weren't super men, Jocks or even adults. Reggie (Reggie Bannister) was a middle-aged balding ice-cream man and Mike (A. Michael Baldwin) was barely a teenager and yet they both went toe-to-toe with The Tall Man. They did what most kids that watched these films wanted to do, fight the boogie man, and live to talk about it. I first saw these films on cable around 1981 and then I owned the first two movies on VHS, let me just say that these films look excellent. I notice almost no artifacts in the movies themselves and the blacks look deep and the colors look vibrant. Much of this film is purposefully shot at night, and at no time do the scenes suffer, the details remain crisp and clear, not drowned in a black smudge. One of the most iconic scenes in the first film is when a ball is chasing Mike through the corridors of the mausoleum. The Red velvet curtains stand out against the white marble, and when the ball accidentally attacks one of the Henchmen instead of Mike, the blood and yellow liquid display vividly, especially considering they are all in Standard Definition. Let me not fail to mention all films are Dolby Digital 5.1. The score and atmospheric music are well balanced and never overpower the dialog, and the special effects, growling and screaming as well as explosions and car crashes sound fantastic. Spread across all 5 discs are countless Special features, Making of featurettes, Audio commentaries with the Writer/Director Don Coscarelli as well as all of the actors. There are Special effects, Deleted and Behind the scenes videos, a Blooper Reel and there is even an old and hard to find a short film about Abraham Lincoln starring everyone's favorite Tall Man, a young Rory Guy( Angus Scrimm). There is definitely tons of extras and it's a blast to experience these movies from the other side of the camera lens. My one complaint is the packaging, all five discs are on one spindle, sitting one on top of the other, and it makes for a cumbersome way to sift through the movies to get to the one you want. I have never seen it done in this manner before and it is not only a cheap way to package multiple movies, you risk scratching them. Other than the one complaint, this is a solid set. There's one thing most fans agree on, Angus Scrimm's gravitas and gleeful grimness helped propel these stories and make us want to see more of him and his world. We could not get enough of the sci-fi inspired horrors of his Red Planet and we needed to find out more about what lay on the other side of the Dimensional Gate. We may have lost a horror icon in 2016 but his legend and legacy live on, and with this collection: "It's Never Over!" 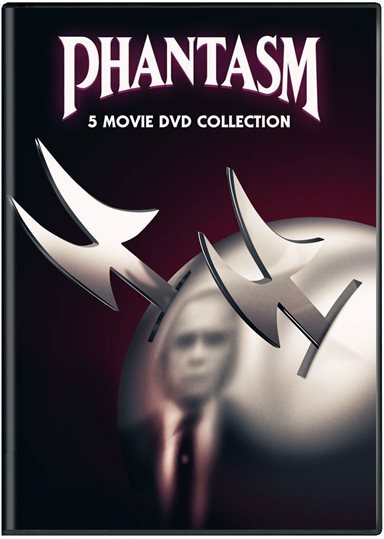 Download Phantasm 5 Movie Collection from the iTunes Store in Digial HD. For more information about Phantasm visit the FlickDirect Movie Database.